Life is so strange. I work in food service and my days are filled with food, menu planning, nutrition… the list goes on and on. Yet, I never have time to cook. I’ve been living on school food and whatever I scrape up from the fridge at home. I was ready to live this life of school salads and random dinners for a couple months. When I started this job in July, I was told that everything would calm down by October at the latest. Cravings are a funny thing. I never seem to crave food that I have in the house. Or even food that is easily accessible to me. It’s always something that I can’t have. In this case, it was apple pie bread. 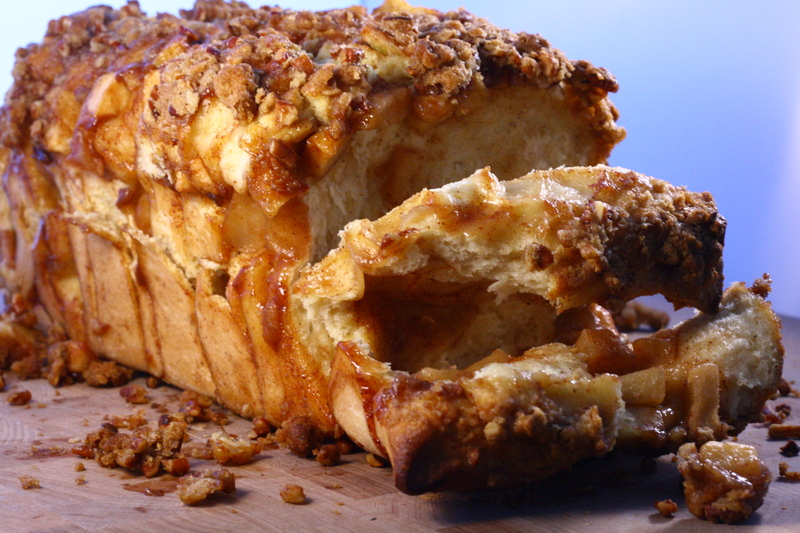 More specifically, it was apple pie bread from Breadsmith. The craving hit on a Saturday night. By Sunday I was getting a bit cranky because I didn’t have any. I got ready to make the short drive over to Breadsmith and popped onto their website to make sure they had it. My world crashed around me. They don’t have apple pie bread on Sundays. They have it almost every other day of the week. But not Sundays. I almost launched my iPad across the room in frustration. I stewed for a few minutes before deciding to make the dang thing myself. Now, fair warning: this is not a replica of Breadsmith’s bread. It is really good though. Honestly. Mike and I inhaled half the loaf in about 15 minutes. The rest of it was gone before Wednesday. Preheat oven to 350°F. Grease a 9×5 loaf pan and set aside. Combine filling ingredient in a saucepan over medium-high heat. Bring to boil. Reduce heat and simmer for 4 minutes. Remove from heat and set aside. Whisk together flour, yeast, salt, and brown sugar in a large bowl. Add in water, egg, milk and butter. With the dough hook on your stand mixer, combine all ingredients until dough comes together. Remove dough from bowl and place on a well floured surface. Knead for 5 minutes or until dough is smooth and elastic. If dough is very sticky, add additional flour 1 tablespoon at a time, until dough is no longer sticking to the counter or your hands. Roll dough out into a 1/4 inch thick rectangle. Spread filling over the dough evenly, reserving 1/3 cup of the filling. Using a pizza cutter, cut the dough into 4×5″ rectangles. With the loaf pan on it’s side, stack the pieces on top of each other. Set the pan down and, if needed, spread the dough gently to distribute through the pan evenly. Sprinkle the remaining 1/3 cup of apple filling on top of the dough. Combine streusel ingredients together in a bowl until well combined and crumbly. Sprinkle over dough. Bake for 55 – 60 minutes, or until bread is golden brown. Let cool in pan on wire rack for 20 minutes before running a knife along the edges to loosen. Enjoy!! This looks awesome! Thanks for sharing the recipe – I can’t wait to try it! That’s a good lookin’ photo! Did you use your new camera? ALSO I’m so glad you’re posting again! I missed you! What temp should the milk be when adding the yeast/flour mixture? Hi Marg! The milk should be warm, but not too hot. I didn’t check the temperature when I made this, but if you’ve got a thermometer handy I would suggest about 110F. Hope this helps! Thanks so much! I can’t wait to try it this weekend. Do you ever make double batches or freeze a loaf? I haven’t tried doing either, but I don’t see why you wouldn’t be able to. Let me know how it goes if you do try doubling and/or freezing! Did you have to let the bread rise at all before baking? New to bread making! Thank you in advance! Photo looks simply delicious!